Choose a strong leather dog harness for agitation and control. Sizes: S-XL. Colors: black and brown. 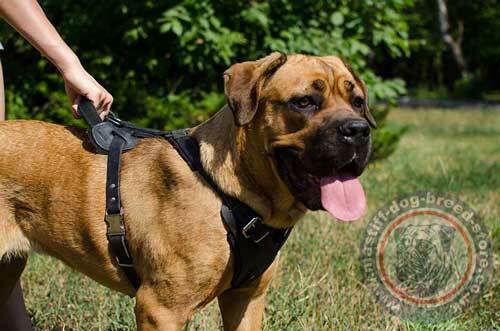 Buy Cane Corso harness for reliable control over your strong mastiff! 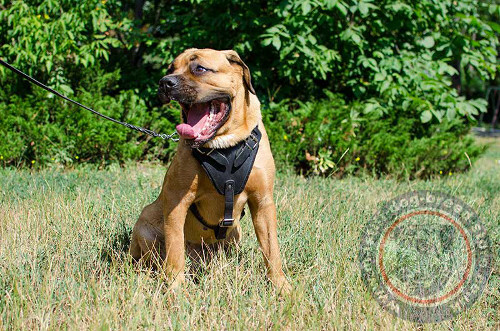 This strong dog harness is the bestseller and one of the favorite tools of dog trainers for dog sport and service dogs. The reason for this is a perfect design for comfort of a dog and a handler and reliability in any situation. Strong dog harness for Cane Corso is accounted to manage huge mastiff strength. That's why it is handmade and reliably stitched. 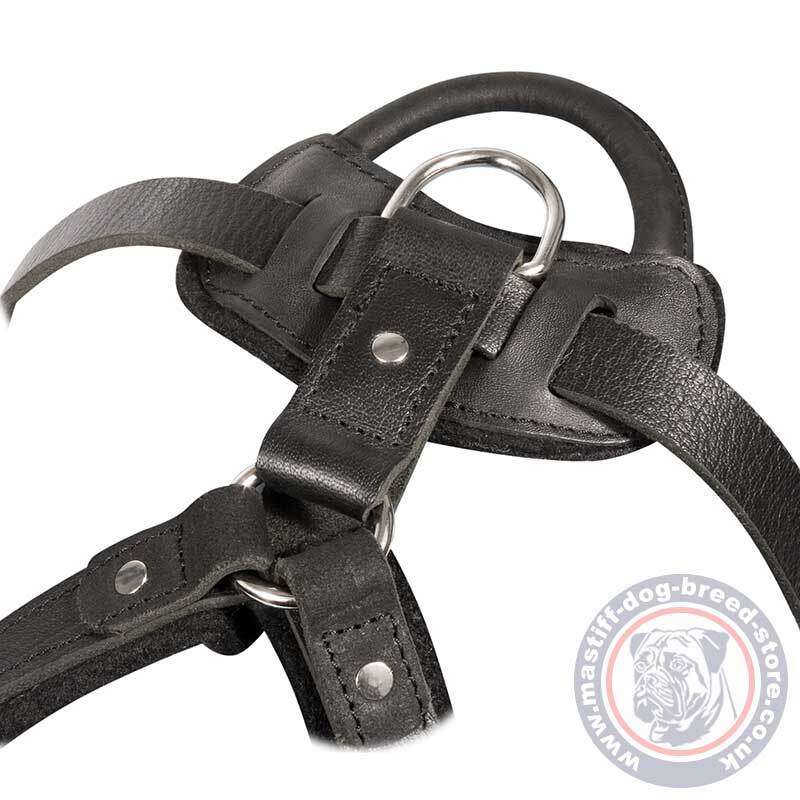 This service/sport dog harness is made of strong, thick genuine leather with smooth edges. It will serve you for many years, especially if stored properly. 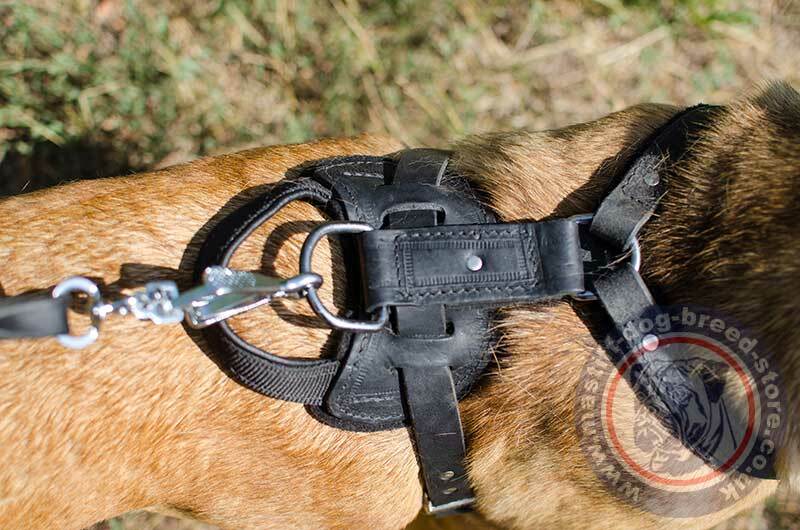 Strong dog harness may be equipped with a back handle up to your choice to make control over your dog more comfortable and reliable. The triangle chest plate design has shown itself as the right decision for dog comfort and protection of dog chest in attack, dog training and service. The plate is padded with soft felt lining. 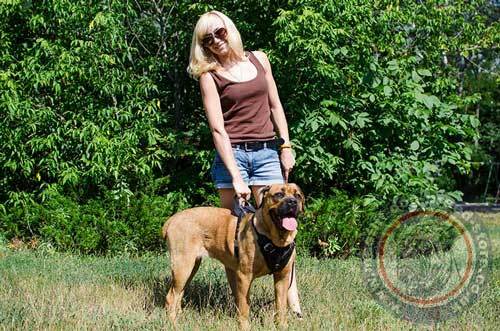 This leather dog harness for Cane Corso is produced in several sizes. Each size is easy adusted in a definite span. It is regulated by additional holes for buckles adjusting. All the metal details are rustproof, nickel-plated. There is a cast metal D ring at the back plate for a dog lead fixation. Extra strong dog harness has a perfect design to train a large, strong dog and to handle mastiff temperament at walking. 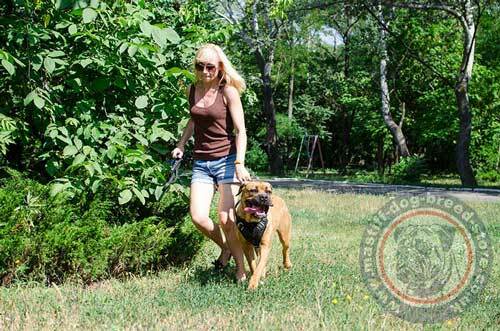 Control, Walk and Train Your Dog Comfortably!